Companies spend a significant amount of time and money on advertising and marketing their brandâ€™s products or services. It used to be that when you advertised on offline channels like TV and print, you just hoped for the best in terms of results. Now, with digital marketing and digital advertising you can track and tweak your ads for better performance as often as you need to. Unlike old-fashioned advertising, what I love about the digital world is it's real time tracking. You can monitor and make improvements instantly, or adjust creative to a different media channel and thatâ€™s itâ€”youâ€™re done! This means you donâ€™t have to shoot that commercial all over again if itâ€™s not driving results, or you donâ€™t need to re-create and republish a new print advertisement when you want to make a change. With digital advertising, you simply adjust the content as needed and youâ€™re ready to go. Every successful advertising campaign contains a clear and compelling call-to-action (CTA). This â€œbuttonâ€� tells the user what the next step is and is how they get from the advertisement back to your site, moving them further down the funnel and closer to the point of conversion. When it comes to selecting a CTA, you want to focus on language that is relevant to your brand, service or products, and completely obvious to the user. Anything ambiguous can confuse the user, and even if they click on the CTA, arriving at an onsite page that doesnâ€™t meet their expectations wonâ€™t result in a conversion. That being said, you want to avoid generic language like â€œlearn moreâ€� or â€œread moreâ€�â€”while this can be relevant to what youâ€™re promoting, it isnâ€™t unique to your brand, or even your industry. In the example below, Sothebyâ€™s has a beautiful digital ad campaign that promotes different destinations. The imagery is striking (another must-have for successful digital advertising), the text is readable, and itâ€™s ultimately a clean design. However, there is no real CTA. As a user, I could of course click on the ad and be directed to their site, but there is no real incentive to do so and no real button showing me what step to take next. Simply adding a CTA button to this ad would likely improve the performance of these campaigns and result in higher conversions. It should come as no surprise that messaging is important. With any digital platform, messaging is critical as itâ€™s the core communication with a potential customer. In terms of digital advertising, when you donâ€™t have a ton of copy space or even time to capture user attention itâ€™s important that messaging be compelling and, most importantly, succinct. In the example above, Biotherm incentivizes the experience for the potential customer. Their core message â€œEnjoy Free Shipping + 25% Off All Ordersâ€� captures the userâ€™s attention and for someone already interested in their products, itâ€™s likely to be that last added touch to convert. For all brands, this is an incredibly well done ad to take notes from. If youâ€™re running a retargeting campaign where the user has already visited your site, for example, this type of incentivization could not only help you stay top of mind as the potential customer navigates other sites, but can serve as the final touchpoint before the user finally makes the purchase. Whatever the content youâ€™re advertising is related to, you should always drive users to a page that is relevant to that content. This simple step will help to keep users on your site, offer a better user experience, and ultimately improve conversion rate. If youâ€™re an athletics brand and youâ€™re advertising womenâ€™s running shoes in an AdWords campaign, sending users to your womenâ€™s running shoes page will help facilitate the conversion process. The more relevant the page is that you drive clicks to, the greater likelihood that the user will follow though and convert. After all, your advertisement has captured that userâ€™s attention enough that they clicked on the ad, so the likelihood is they want more information pertaining to that specific subject â€“ not general information youâ€™d find about your brand and entire line of athletic attire on your homepage. Sending users to your homepage instead of a designated landing page that is correlated to the particular campaign can be a costly mistake. Users generally wonâ€™t search your site for the item theyâ€™re looking for. As a brand, bringing the potential customer as close as possible to their unique needs and the point of conversion is not only the best approach, but also the best user experience. For each of your digital campaigns, itâ€™s essential that you think about where youâ€™re serving users with these ads. The likelihood is that the ad will appear while the user is absorbing other content somewhere else online, so the way your ad appears visually is important. Using high-quality imagery that is telling as to what the ad promotes is one of the most important features for all successful digital advertising campaigns. Failure to use imagery that is captivating or visually appealing doesnâ€™t help capture the userâ€™s attention. 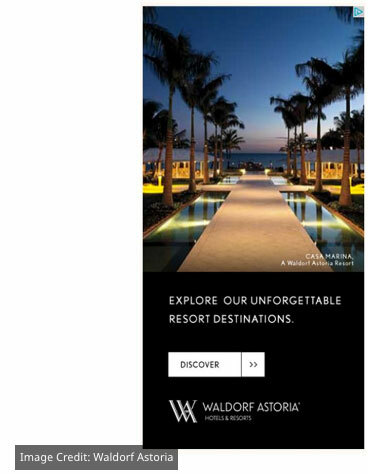 In the example below, Waldorf Astoria uses beautiful photos of their resorts to advertise to a targeted set of users. Not only does this stand out as the user scrolls through the page, it truly sparks interest. For brands in the B2B space, or in industries where imagery may not be as â€œnaturallyâ€� beautiful as a beachfront resort, there are still options. Focus on imagery that is bold, clean, and compelling. In a lot of ways, imagery should tell the story your brand is trying to convey and give the user a solid expectation of what you have to offer. This is especially important for new or potential customers who may not be familiar with your brand. If the imagery in your ads doesnâ€™t stand out, they may not even recognize your brand or your products if they see them later on a different platform. Youâ€™ve probably heard it said many times, that for any marketing channel, testing the effectiveness of your efforts is important. When youâ€™re running digital advertising campaigns, this is no exception. Without monitoring your campaigns, how are you able to identify areas to continue focusing on versus areas for improvement? Sometimes, seemingly arbitrary factors like time of day, language choice, audience segment, or image selection can really play a role in the success of your campaigns. For that reason, itâ€™s critical that you pay attention to these factors and monitor which campaigns have which varying elements. If youâ€™re finding success with one campaign, or finding an alternate campaign to be less effective, donâ€™t be afraid to change it. A/B testing with digital ads, where you test ads with varying content, can be incredibly valuable when determining which messaging or content resonates best with your audienceâ€”and often for reasons you canâ€™t foresee. Also, testing your ads before you implement them is critical. More times than Iâ€™d like, Iâ€™ve seen brands with fantastic ads pointing to the wrong pages, 404 pages, or with messaging targeted to an audience that Iâ€™m mistakenly segmented in. Take the time to make sure your ads appear as they should and direct users to the right pages. When little mistakes like this happen, not only have you wasted the resources spent for this particular campaign, youâ€™ve also adversely impacted the user-experience. This extra moment of testing can save your company a lot of money in the long run. In this day and age, digital advertising holds a ton of potential. For most brands, itâ€™s one of the most effective ways to get your company, products or services in front of a qualified and targeted user. However, if youâ€™re not following the right guidelines to make your digital advertising as impactful as possible, the likelihood is that you wonâ€™t garner the results youâ€™d most like to see. Keep in mind the above tips when crafting your campaigns and optimizing your conversion rate. Copyright 2017 Forbes Media LLC. All rights reserved. From http://www.forbes.com. By Gabriel Shaoolian, Contributor.